Two weekends ago I traveled to Samut Songkhram, the smallest of Thailand’s 77 provinces, located about ninety minutes to the southwest of Bangkok. There I had lunch with Ajarn Yai (literally, “big teacher”), the retired director of the rural school where I previously volunteered as an English teacher. This being lychee season, Ajarn Yai insisted that we take several big bunches of freshly-harvested lychees. 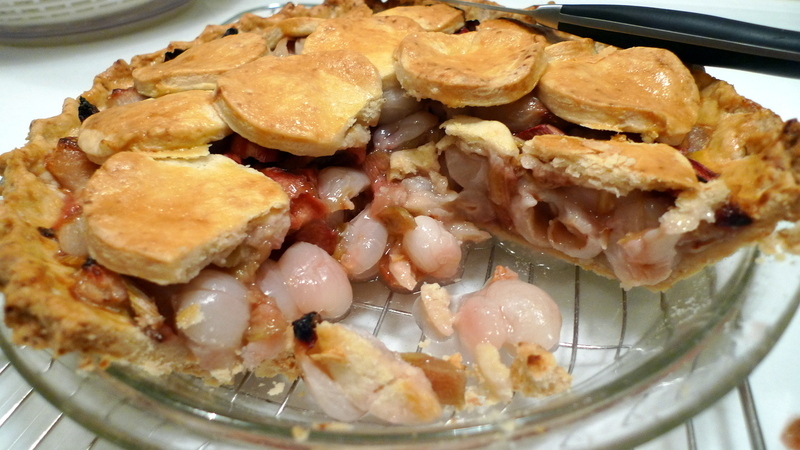 Once home, I decided to try something new: a lychee-rhubarb pie. Lychee are the fruit of an evergreen tree that grows in tropical and subtropical climates. The fruit is round, about one inch (two to three centimeters) in diameter, and is covered in a leathery rind. Peeling is easy, if slightly tedious. The interior flesh has a grape-like texture – firm but slightly squishy. Most lychee have a large, inedible pit but some trees produce seedless fruit informally called khathoey (or ladyboy) lychee by the Thais. 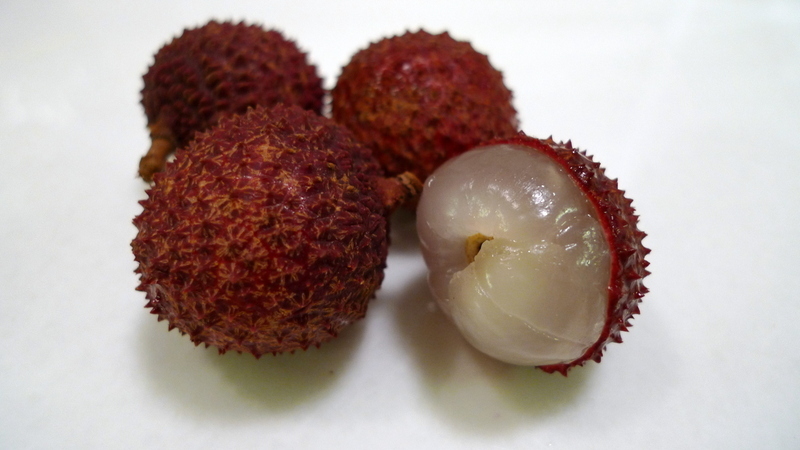 The flavor of lychee is sweet and perfumey, not overpowering but slightly astringent – especially in not-quite-ripe fruit. It is this astringency that made me think of rhubarb. Since the lychee were sweet and astringent and the rhubarb is tart, I thought they might make a refreshing dessert – kind of in the same way that a lemon sorbet can cleanse your palate between courses in a meal. 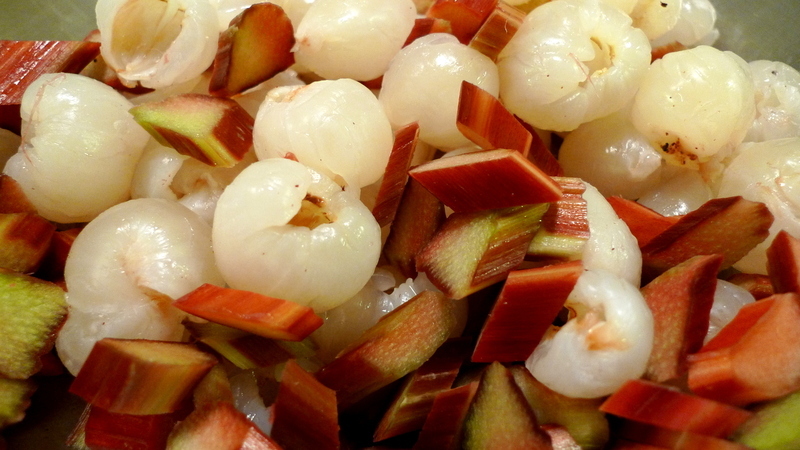 I peeled the lychee, chopped the rhubarb, and mixed in some sugar and corn starch as a thickener. 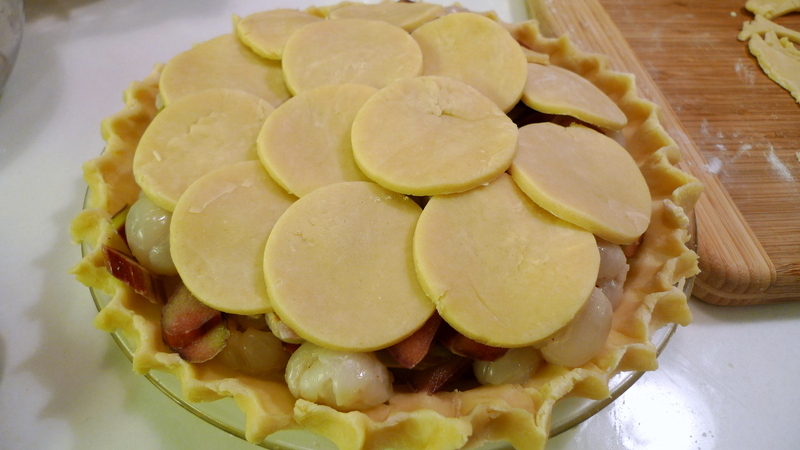 Trying something different for my pie crust, I cut rounds (in honor of the shape of the lychee) to form the top crust. It then went into the oven for about 40 minutes until the crust was golden and the filling cooked through. The end result: The filling was a little dryer than I would have liked and quite tart, too. That’s probably because I added only a half-cup of sugar. I liked the flavor, though, and it worked very nicely as a refreshing dessert after a richly flavored meal, cutting through the flavors of the meal better than a heavier, sweeter dessert would. Next time, though, I think a bit more sugar is called for and also a few minutes of pre-cooking the filling to extract more juices. This entry was posted in Uncategorized and tagged baking, cooking, dessert, food, Lichii, Lychee, Pie, Rhubarb by christao408. Bookmark the permalink. Looks delicious. Your next attempt will surely result in perfection. That sounds wonderful! Do try again, with a little more sugar and maybe some water! For appetizers, try lychee stuffed with cream cheese and chopped macadamias! Oooh, I love peeling lychees! It’s one of my favorite activities haha. Although I don’t really enjoy eating them, there’s something about the texture that’s just a bit addicting…Anyways, your food is always pretty and looks delicious, as always. I like the combination. I agree you need sugar to taste but it does sound like a good ending to a rich and heavy meal. I like lychee, and I like pie…so this I have to love! Very pretty! I would have cut the lychee… Still it sounds like a good combination. Pineapple Rhubarb is still my all time favorite combination. i’m still not sure if i would like the combination, although i do love lychee. hmm… i bet a rhubarb-lychee sorbet would be delicious! @murisopsis – hahaha chris and i were just talking about that pairing! must try it once we get some rhubarb this spring. “It’s sweet with the meat of the lychee nut, combined with the cumquat rind….the kind of confection to drive a man out of his Mesopotamian mind”…… lyrics from a song from my favorite musical “Kismet”… but have only tasted lychee once at one of our local Asian restaurants…..all by itself with nothing else enhancing or complimenting it…thought maybe it was like canned fruit. At the time, it didn’t impress me; but your rendition of it looks mighty tasty, Chris!!! such an interesting substitute for strawberries. i wonder if lychees can provide enough sour-sweet-tart combination that strawberries do with rhubarb. but i bet it is quite aromatic. @rudyhou – The lychees are definitely a bit more astringent than strawberries… should have added a bit more sugar, maybe. @Gma_Joyce – I know the musical reference! @kunhuo42 – That would be an excellent sorbet. @murisopsis – As Aaron mentioned, we’ve been discussing that via facebook. I’ll have to suss out some pineapple and give it a try. @CurryPuffy – Really!? That’s uncommonly large. @grannykaren – Well, leave it to me to think up some unusual combination, right? @Devilzgaysianboi – Exactly, that kind of tartness that cleanses the palatte but also puckers the lips. 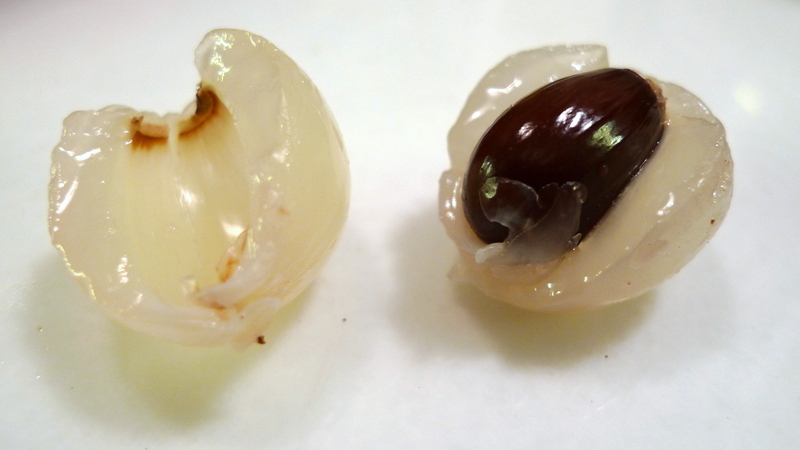 @hilabpartnerxD – Lychee peeling as meditation? @Inciteful – Or else I’ll move on to something else…@slmret – Oh, now *that* sounds like a good combination. @Fatcat723 – Lessons learned, right? @Roadlesstaken – There you have it! I wonder if you should have used Rambutan? Oh yummy. That looks absolutely wonderful. @PPhilip – @Grannys_Place – Thanks both for the recommendation. Yes, rambutan would have been an option, too. Although perhaps harder to peel? @christao408 - Heh, heh, the canned Rambutan is already peeled….